Wholesale fashion leather-fancy-rhinestone-belts lot-25 Lot contains a large assortment and variety of styles colors and sizes. All products are new. Closeout price! Supply is running Low. Wholesale Belts Lot colors sizes and styles may vary and are assorted due to the fact that these products are purchased in bulk from large department stores Closeouts & overstock lots. The Average Suggested Retail Price of this lot is guaranteed to be the same or of greater value then what is displayed in the product image. ALL NEW UNISEX PYRAMID BELTS! THESE ARE THE HOTTEST BELTS OUT! 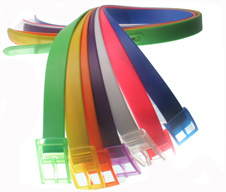 EACH CASE COMES WITH 72 BELTS IN ASSORTED COLORS.